In San Francisco in 2016, a lot of people are going to tell you that everything is terrible, that things aren't the way they used to be, and that everyone has forgotten how to have fun. Gone are the days of rocking Monday and Tuesday night parties  mostly, anyway  and in their place you have Friday night noise complaints from condo owners who just moved in next to a nightclub that's been there 20 years. Go out to a bar or club on a Saturday and you're just as likely to find people huddled in corners, even in groups, staring at their phones, joylessly drinking their well balanced Mai Tais and discussing their vesting schedules instead of texting their coke dealers or figuring out where to go after-hours like people did when this town still had an edge. Some of the above is no doubt true. But to generalize and say that San Francisco's no fun anymore, and that fun things don't happen, or to make the blanket statement  as, seriously, tens of thousands of you have done in the last couple years  that Evil Tech has come and destroyed everything good and whimsical and creative about the city and that everyone just listens to Coldplay and drinks expensive Scotch and goes to bed early is, most certainly, irresponsible hyperbole. I am here to reiterate, with the help of a few local experts who make their living in the nightlife, that yes, the city has changed. Yes, things are quite sleepy in the early part of the week in almost all corners of the city  though that has been the case, with a few exceptions, for a long time. But no, not all is lost, and people do still go out, but they go out a little differently than they used to, some of them less frequently for reasons I'll get into below, and lots of bars and clubs are still thriving in the age of hookup apps and liquor delivery apps. San Francisco's not alone in facing the many ways in which Millennials, on-demand television, and smartphones have impacted how and when we have fun. It was with a fair number of sighs and eyerolls that I read this piece in the New York Times' T Style Magazine titled "Is Staying In the New Going Out? ", describing from one woman's perspective how neither she nor her coworkers or friends really went out anymore. A few years ago, my coworkers and I exchanged happy highlight reels of ambitious urban activities before cracking open our laptops and pouring ourselves a tall, refreshing glass of work. One of us went to an off-Broadway play. One of us went to a Beyoncé concert. One of us went on a date. We had fun! The reason is obvious: We no longer go out. And why would we, when the allure of staying in has reached irresistible proportions? Why risk a restaurant when you can order Seamless or sauté premade gnocchi from Blue Apron? Why go to a bar when you can swipe right? You get the point. It's yet another trend piece about how "binge-watching" is a thing now, and how urban professionals lead far more insular, depressing, anti-social lives because of TV. Or something. Molly Young, the writer of that piece, may or may not speak for an entire generation, or just a specific subset of New Yorkers who  perhaps rightfully  have grown disillusioned with the nocturnal draws of their formerly sleepless city, and the difficulty of getting anywhere, and the idiocy of their peers, and instead they hole up in their expensive apartments and get the most mileage out of their cable bills and Hulu subscriptions. I spoke with several San Francisco nightlife people to get a sense of what's working in our city, and how things may have changed in the last few years. You may be surprised that, for the most part, they were pretty confident that San Franciscans aren't all staying inside every weekend, despite any reports to the contrary. "Yes, there's more to watch at home than ever before, and I've seen ​a lot more to-go orders from Palm House," says Anderson Pugash, one of the partners behind The Dorian, SoMa's Bergerac and Audio, and tropical-themed restaurant Palm House. "But other than that things don't feel all that different." 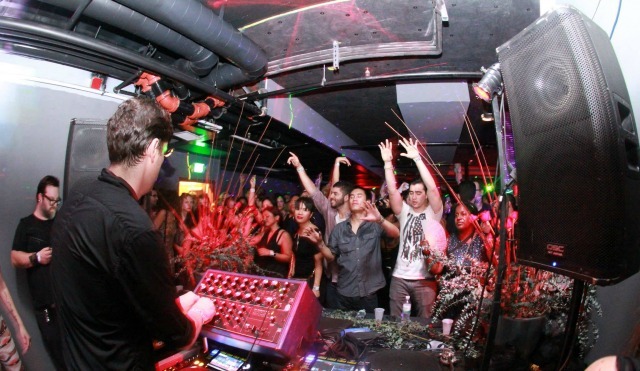 Pugash says that the music scene in San Francisco has stayed especially vibrant, and his club Audio, which has a music-centric approach in booking many name DJs, "has never been busier." Juan Garcia, a local promoter who also works full time booking and coordinating events at Temple nightclub, sees it a bit differently. He says "Nightlife has changed dramatically in SF in the last five years." He cites online dating and hookup apps as part of the trouble, but he qualifies that by saying more people may be seeing these apps as time-wasters by now, "riddled with phonies" and not really an adequate replacement for real-life socializing. "Younger people are wanting interaction and finding more interest in vibrant community-based events that you dress up, travel, or get naked for," Garcia says. "Burning Man camps and fundraising groups are the new promoters." There has, at least in SF's gay nightlife world, been a steady drifting away from large weekly club nights like the long-gone Club Universe toward smaller, more niche-driven events, and bigger parties that only happen once a month or every two months. One example is the ongoing series of themed parties thrown by Mystopia, a Burning camp, which happen on occasional Saturdays at Mighty. And as far as weekly things go, the success of Oasis in its first year and a half, drawing decently dense crowds every Friday and Saturday as well as other nights, is sure proof that gay guys, at least, aren't all staying home on Grindr and Scruff. Pugash admits, though, that "Cell phones often make people less present and engaged​ with their surroundings." He adds, "Between social media and everyone carrying a camera in their pocket, we are always forced to be on our best behavior." And sure, too many photos put a damper on things in a town previously known for getting wild and NSFW on the regular. Mica Sigourney, better known to many in the gay party scene as drag queen Vivvyanne ForeverMore, adds some nuance to the discussion of how he sees nightlife shifting. And yes, he says, people on their phones are definitely making it harder to host a party and keep their attention. "I've been Scruffed at my show by an audience member who is at my show," Sigourney says, referring to his gig as MC of the Friday night drag show SomeThing at The Stud. He says, regarding the photo problem, "People don't just take pictures at the drag show but also take the time to upload to Instagram and Facebook so other people at other clubs can see what they are doing. So there is socializing and meta-socializing going on." And he adds that our saturation of media, always at the ready in our pockets, changes nightlife dynamics for the worse. "In my experience there's less thirst for actual experience," he says. "Rupaul's Drag Race is such a good example: Instead of flocking to see local talents in bars it takes a TV reality star to draw huge crowds to the clubs these days." Sigourney's club isn't hurting for crowds if a recent Beyoncé Lemonade tribute night was any example. And, he says, "There are still very magical things happening every night at clubs, but fewer witnesses for those. I don't think nightlife is dying just shifting... it's still so vibrant here. But I'd say it's a different ethos when people are out, a little less present, or rather multi-present, everyone both in the room and simultaneously on their phones." Another factor during these recent boom times, says Garcia, is that big SF clubs have become more economically stratified  a lot more like the glitzy nightlife venues in Los Angeles and Las Vegas that people see on reality TV and celebrities' Instagram feeds. "The larger clubs don't allow you to sit down anymore without a service charge or drink-package minimum," he says. "They're adding corny pomp and circumstance to ordering a bottle of Dom Perignon to lure guests who are not really there to interact but would rather just be seen, and envied. It's all long lines and fake VIP these days, so you see nightlife getting split down the middle, with half of it requiring a whole lot more money." Pugash, for his part, remains mostly bullish about local nightlife, going forward. But he does note that it's become increasingly hard to open new nightspots due to the non-fictional "war on fun" that's gone on in multiple neighborhoods. "A lone cranky neighbor has way too much power in this city and some have even shut down longstanding institutions due to noise complaints," he says. One example is the deal struck between the condo developer at Market and Sanchez and the operators of the Swedish American Hall and Cafe du Nord. The latter, once a loud below-ground rock venue, has become a restaurant which will have occasional  but likely not very loud  music acts in the future, and the former, being run by NoisePop, is devoted to acoustic music now. Still, Pugash points out, "Outside Lands, Decompression, the How Weird Street Faire  there are still lots of quirky and quintessential SF events around to keep things thriving." (It should be noted, though, that those are all primarily daytime events.) And, for what it's worth, chemical testing conducted by New York Magazine last year determined that, yes, San Francisco has all the good molly. San Franciscans, hopefully, will always know how to party, and it's the duty of those who have been here the longest to keep all the zany and drunken traditions alive for each successive wave of newcomers. "We are still the largest consumers of Fernet per capita of any city in the world," Pugash says. And to be sure, our well worn livers certainly had better count for something.